While pundits concentrate on noisy clashes between Donald Trump and Angela Merkel in Brussels, few have noticed that Colombia is joining the North Atlantic Treaty Organisation (Nato) as a “global partner,” the first Latin American country to do so. In doing so, it joins eight other “global partner” countries in Nato: Afghanistan, Australia, Iraq, Japan, South Korea, Mongolia, New Zealand and Pakistan. Colombia has been seeking to join Nato since 2006. As a stepping stone, it signed an information sharing and security agreement in 2013 and in 2017 a partnership and co-operation programme. But the decision to join is a highly controversial step to take, causing alarm in Latin America. 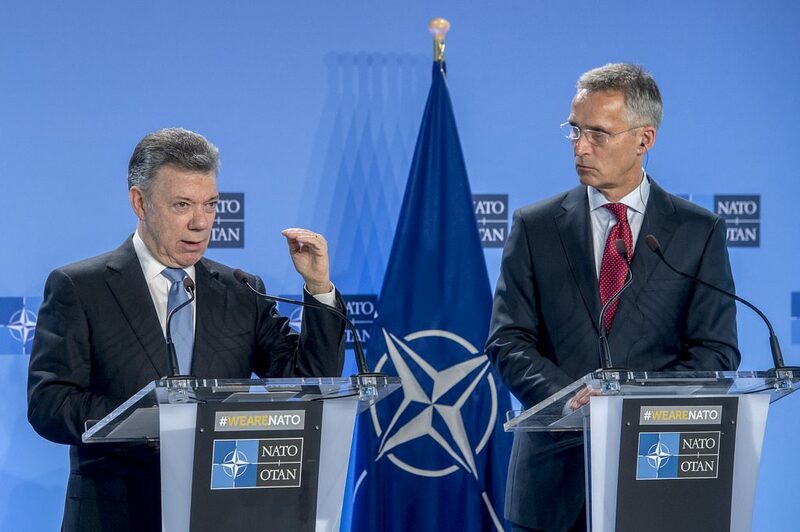 Colombia has diplomatic commitments that it would be violating with its admission to Nato. These include being a signatory to the Treaty for the Prohibition of Nuclear Weapons in Latin America and the Havana Declaration, which proclaims Latin America and the Caribbean a zone of peace. It also contravenes security agreements made by the Defence Council of the Union of South American Nations (Unasur). Colombia itself is beset by massive inequalities in income and wealth, particularly land ownership. Systematic violence by the Colombian government and paramilitary organisations, coupled with a variety of legal devices, have enforced political exclusion of progressive movements and politics in the country for decades. The legal left is a small minority constantly under pressure, while trade unions, campesino organisations, indigenous and popular movements are targeted and social protest criminalised. Despite a 2016 peace agreement between the Colombian government and the Revolutionary Armed Forces of Colombia (Farc) guerilla movement, assassinations of political activists have continued. Nearly 300 community organisers and activists have been murdered since the agreement was signed in November 2016. Hundreds more have received death threats. Colombia has long played a reactionary role in the region, undertaking a range of activities serving to counter and subdue democratic and popular movements in various countries. The US’s contribution, at first in pursuit of its so-called “Plan Colombia” formulated in 1999 ostensibly to combat drug trafficking, has been to fund and train the Colombian military in counter-insurgency strategies and initiatives. As part of this, paramilitary groups have been promoted as an integral tool of state repression. The implementation of “Plan Colombia” reduced coca planting by less than 10 per cent, but displaced more than three million Colombians between 2002 and 2010. During this time Colombia’s military spending, fuelled by US support, ballooned. Between 2002 and 2010 Colombia spent $100 billion (£75.5bn) on defence. Colombia’s army is among the largest in Latin America, on a par with much larger Brazil, and in the top 20 in the world. No doubt as a reward for this largesse, in 2009 Colombia granted the US access to seven military bases inside the country, enabling it to pose a threat to governments deemed to be unsuitable. Neighbouring Venezuela is perhaps most at risk of intervention from these strategic locations. The new Nato agreement further strengthens the ability of the US Southern Command forces to police the region by consolidating Colombia’s client relationship with the United States. US funding to the Colombian armed forces has also been put to external use. Colombia launched a military raid on Ecuador in March 2009. Colombian paramilitaries have been active in Venezuela, Bolivia, Honduras and Ecuador, with the suspicion that in the latter three countries they have been clandestinely training others in their techniques. The Colombian military forces have also been providing advice on the restructuring of the Honduran, Guatemalan, Dominican Republic, and Panamanian police forces, according to data published by the International Security Studies Group. Joining Nato could enable Colombia to both legitimise its unofficial training and extend its export of military services. Colombia has also proved a reliably useful ally for the US on a range of diplomatic issues, such as promoting a regional free-trade agenda or undermining regional initiatives such as Unasur. In 2016 Brazil, Ecuador, Nicaragua, Venezuela, and Bolivia expressed concern about Colombia’s approach to Nato and even proposed an urgent Unasur meeting to discuss the issue. President Santos’s decision at a time when Colombia is trying to consolidate its peace process met with some internal criticism, but president-elect Duque is expected to maintain, if not strengthen, Santos’s foreign policy stance. Our international solidarity with Venezuela, against Trump’s aggression, and that of the US’s key allies in the region, could not be more urgent.